Perfect, tooth-achingly sweet comfort food. 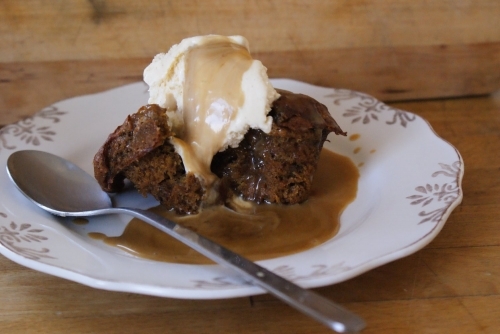 Dates and dark brown sugar give this it's buttersctoch stickiness with a divine caramel sauce to pour over. We like to cook them in muffin tins for individual puddings. Put the dates and 125ml water into a small saucepan, heat until bubbling, take off the heat and stir in the bicarbonate of soda and butter until melted. Meanwhile, whisk the egg in a large bowl, add the date mixture, flour and baking powder and stir until combined. Grease six holes in a muffin tray and divide the mixture into them. Bake at 180C for 20mins until a cake tester comes out clean. To make the sauce, add all the ingredients to a small pan, bring to the boil and simmer for a few minutes. To serve, place the pudding on a plate, pierce a few times and drizzle the sauce over. Top with a big scoop of ice cream.